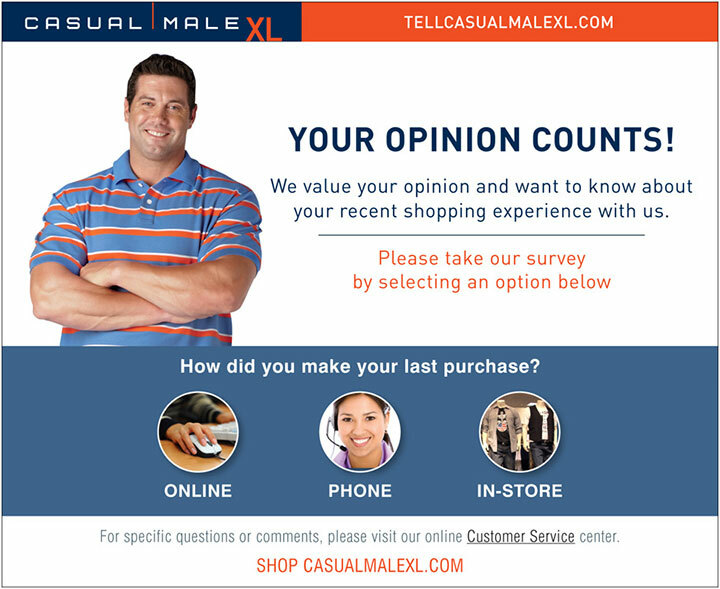 The Tell Casual Male XL Survey, found at www.TellCasualmalexl.com, is an online questionnaire designed by Casual Male XL to determine the consumer’s satisfaction with the company’s products and services. The information is used by the company to improve in certain areas where improvement deems necessary. This survey is done online for your convenience. Taking surveys can seem redundant or boring, especially if you visit many stores that provide surveys. However, it is important to take the survey honestly and take your time because it gives you an edge. You have a voice; you can tell the company truly how you feel. The company gets an edge as well because they know exactly what you like or don’t like and can start to make changes wherever needed. This is a big deal to companies who rely on repeat business and word of mouth (which is practically every company). As a reward for participating, you will receive a coupon for $15 off your purchase of $100 or more. Casual Male XL is a subsidiary of Destination XL, (DXL) the largest retailer of clothing for big and tall men. DXL was founded in 1976, and since then has been one of the most popular sources of plus size clothing. In 2002, the company was purchased by Designs INC. and a couple of years later, the stores were remodeled and champion boxer George Foreman was hired to promote the brand. Casual Male XL stores sell several well-known national brands, including Lacoste, Polo Ralph Lauren, and Geoffrey Beene, as well as several of its own brands. There are about 440 Casual Male XL stores across the US. Have your recent Casual Male XL receipt that contains an invitation for the survey. Answer where you purchased your items, either online, on the phone, or in-store. A pop-up window will open, so make sure pop-ups are allowed on your computer. For online purchases, you will be asked the confirmation code and then click Start. For phone purchases, enter the seven-digit confirmation code and the first letter shown. Click start. For in-store purchases, you will need to enter the store number, transaction number, associate number, and salesperson numbers from your receipt. Turn on your printer and click the print button to print your valuable coupon.